We finally (seem to) have a beautiful weekend weather wise, so let's enjoy it with a few enigmas. We'll reveal all next weekend. In the meantime, let's peek inside THE ANSWERS BOX and discover the results from our June 8, 2013 Puzzle Corner. If you have a "periorbital hematoma", what are you suffering from? You are recovering from a black eye. It's not true that we hum because we've forgotten the lyrics! "Hello folks. If you know what I am (in the picture on the right), then how many new words can you make out of the letters in my name?" 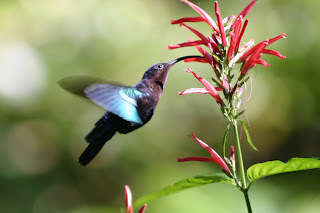 The little fellow with the rapid flight rate is a HUMMINGBIRD. Rib, rid, rig, rim, rind, ring, rub, rug, ruin, rum, run, (and) rung. HUM, HUMMING, and BIRD do count since they were only part of the original (compound) word. Otherwise, more words than the 61 listed above might be possible.